When Laura at Bits of Sweetness posted about having a #PNWSwaps Summer Box Swap, I just had to sign up. 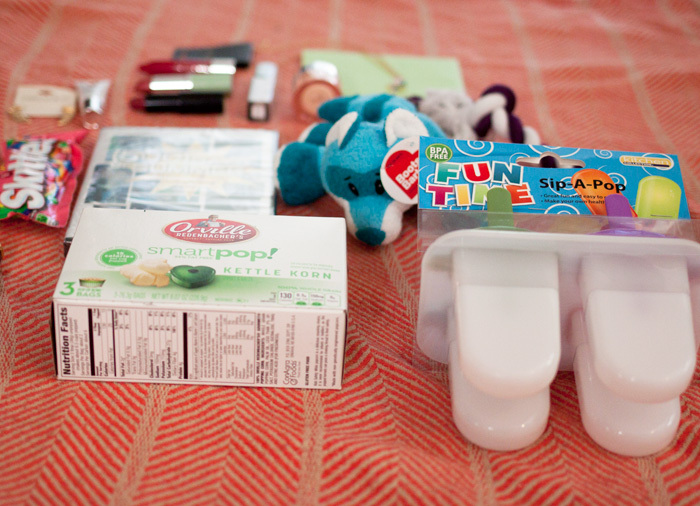 Blogger swaps are one of my favorite perks of being a blogger. It’s a great way to meet new bloggers as well as get a sweet package in the mail. Win-win. I was matched with Lissa of Lifestyles of the Poor and Unknown. She’s a lifestyle blogger who writes about life, beauty, books, and food. 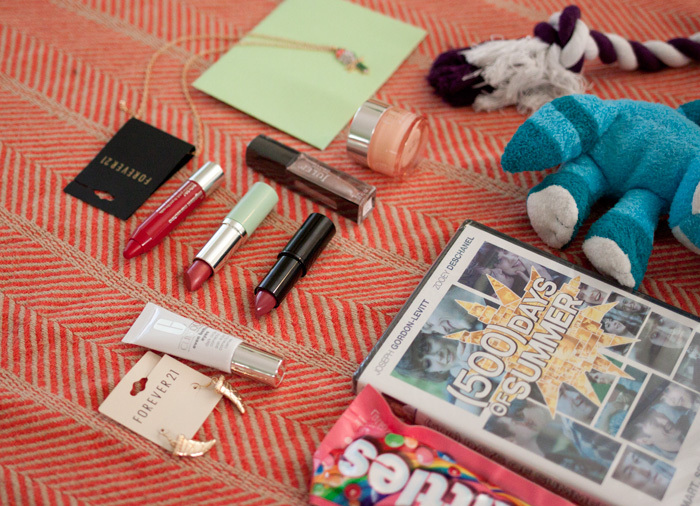 She sent me the sweetest package full of some of her favorite summer items, as well as some items from my list! 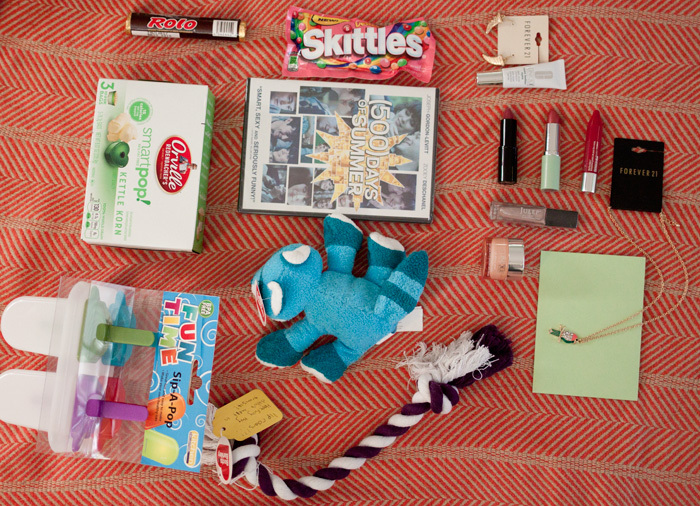 You can see what Lissa got from me on her #PNWSwaps reveal post here. Love that Lissa thought of the little Rigman. 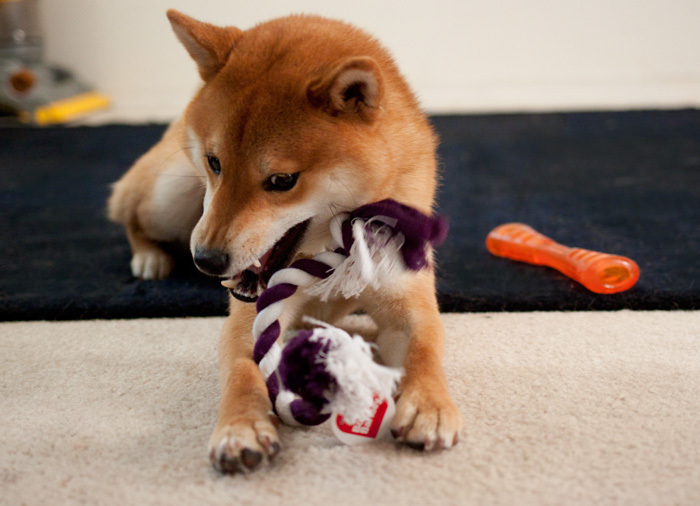 He went for the raccoon when I unboxed it the first time, but for photos he was obsessed with the rope toy. Proof below. They did not melt! Woohoo. Clinique Chubby Sticks are my favorite, and I’m so excited to try out these other colors too! I’m excited to try the dark circle corrector… I’ve always had insanely terrible dark circles, even when well-rested. All and all, another successful blog swap. I can’t wait for the next one, these are totally my favorite. Have you ever participated in a swap like this? If not, would you? I have never participated in a blog swap like this or any blog swap at all. I would absolutely love too! What a fun idea! How would find a blog swap to participate in? Just curious! I am glad you enjoyed everything and that Rigby enjoyed his Toys! BTW what did you photograph everything on? Scarf… table cloth? whatever it is I like the pattern! Such a fun swap box! Is that movie 500 Days of Summer good? Oh I bet! Its so expensive to ship internationally. :( I’ve actually only seen it once, and it was years ago! I’ll have to answer that after I re-watch it! How fun, and great goodies! I did the Love Blogger ( I think thats what it was called) Swap. I had a ton of fun shopping and picking things out. Plus, it is always exciting to swap with a stranger and get to know them! This looks like so much fun and what a lovely parcel of goodies. I’ve never participated in a swap like this. I love those treats that you got, but I also love making popsicles in our molds. This is so awesome. I want to do a blog swap so bad. Aw, so nice to include stuff for the pup too! Looks like a fun box! I need to get involved in these things again. ooh this looks so fun! :) maybe i’ll have to join in on one of these when we get back in town! oh what a great idea, and what a sweet and lovely box from Lissa! and now I want skittles. 500 Days of Summer is such a good movie!! I’m dying to participate in another swap…They’re just so fun! I haven’t seen it in years so I’m excited to watch it again! I’m definitely on the lookout for another one to participate in! What a fun idea! I have never participated in a box swap but I think it’s a fabulous idea! And you got really things from it, too! Great items! So thoughtful! LOVE swaps and have met some amazing people thru them. Sounds fun! Can’t wait to see what you get, Myrabev! Love the box, what great goodies. I love that even your dog got something. Aw what a fun idea! I’m new to blogging and this is so cool. Love you’re blog! So so cute! That sounds ike a great idea! I have never participated in one- but I think it would be good fun! *Sounds LIKE a great idea! Ooh, totally going to check out what you got! Swaps are so fun! Looks like you have some fun new things to play around with! That popcorn is my fav! I love swap boxes! it sounds like you got a great partner! !